Paul, Silas, Timothy and Luke visited Philippe and founded the first church in Europe on Paul's second missionary journey around AD 50 (Acts 16:11-40). This letter was written in about AD 61 from Rome while Paul was under house arrest. He writes from a place of strength and joy to encourage his dear friends in Philippi, who were also facing many contradictions. Words so rich and deep in meaning. listen to and the reader does not get lost in commentaries with any highfalutin jargon. It reveals a broader understanding of the freedom and joy made available in the salvation plan. 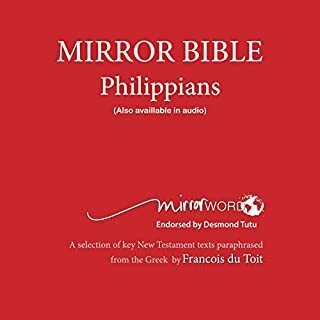 I would highly recommend this audio book as well as the current New Testament Mirror Bible in paperback.